About The Artist: Rescuing legions of parents from the torturous children’s music of the past, The Squeegees provide an irresistibly playful musical adventure for the entire family. Parents love the positive messages emphasized in their songs, including eating healthy, doggy rescue, and environmental awareness, while the band’s younger fans have a blast singing and dancing along to such tunes as “Apples, Oranges and Peaches”, “Nula the Chihuahua”, and “The Elements of the Earth”. Featuring educational, eco-conscious, sweet, and most of all fun songs for the entire family, “Meet The Squeegees” is available exclusively at Target, Target.com and Itunes. 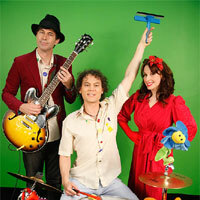 Samantha Tobey and Pierre De Reeder are the kids-at-heart behind this grass-roots musical journey. As a former “Mommy and Me,” music/movement, and baby sign language teacher, Samantha brings a natural flair and years of experience to her passion for interacting and working with children. Pierre is the bass player for the well known rock band Rilo Kiley and a father himself. Chris Phillips, of The Squirrel Nut Zippers, joins them on the drums. Chris is also a family man.